The Cape Henry Oyster Crush hosted by the Cape Henry Rotary Foundation is one of the most popular annual fundraising events in Virginia Beach. The Cape Henry Rotary club came to me and asked if I could create a website that would help them promote the Oyster Crush and manage sponsorship information. I did an initial design and developed the site that served well the first year. The second year I worked with Lori Absher of Lori by Design to match the style and graphics of the site to printed collateral that she had designed. The most powerful part of this site is how it manages sponsors. 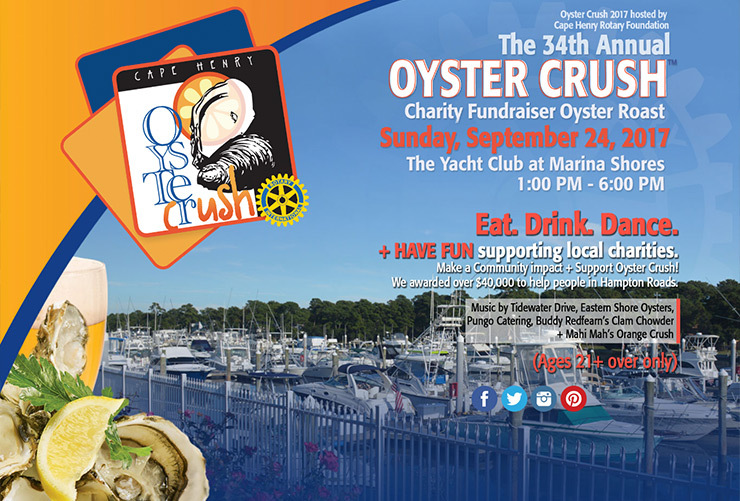 The Oyster Crush has various sponsorship levels, and sponsor logos are displayed on the website in order and sized by the sponsorship level. When sponsors purchase their sponsorship on the site, they provide their logo and URL to be used on the site and a post is created with that content waiting for a site administrator to approve it. Upon approval, the logo is added in the appropriate place and sized according to the sponsorship level. Ticket and sponsorship sales are handled via Gravity Forms with Stripe as the payment processor.